Morecambe recorded a fifth draw in a row as they were held by AFC Wimbledon at the Globe Arena on Saturday. Jake Reeves gave the Dons an early lead before Padraig Amond equalised to end the Shrimps’ home goal drought three minutes before the break. Jim Bentley’s side were by far the more threatening after the break but couldn’t find the goal that would have handed them a first win of 2015. League 2’s resident celebrity front man Adebayo Akinfenwa was the first to have a sight of goal but could only drag his shot wide from 20 yards inside the opening minute. 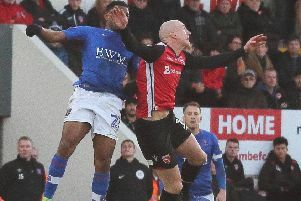 Morecambe’s first flowing move then saw Andy Fleming have a clear sight of goal from the edge of the area but his goal-bound shot was blocked by Deji Oshilaja. The Shrimps’ porous recent defence was breached on 12 minutes but it took a fine set piece to do it. Sean Rigg and George Francomb worked a short corner on the right with Akinfenwa being found at the near post, the big man showing some great footwork to feed the on-rushing Reeves who scored from close range. But the goal didn’t bring the game to life with high winds once again sweeping across the Globe Arena as referee Patrick Miller frustrated both sets of players with a string of confusing decisions. The Shrimps’s leveller three minutes before the break came out of nothing as the game seemed to be drifting to the break. Amond beat his man eight yards out to flick home Laurence Wilson’s vicious, whipped cross from the left with the ball going beyond James Shea and into the far corner for Morecambe’s first home goal in four games. The Shrimps were first to go close after the break, Amond’s fine dummy allowing Redshaw to turn and shoot in the area with his effort going just wide. The hosts were by far the brighter in the early stages of the second half and saw a penalty appeal for handball waved away by referee Miller after Alan Goodall had risen highest to meet Jamie Devitt’s corner. Morecambe continued to dominate without testing Shea, Fleming’s shot from distance sailing over on the hour. Despite no shortage of endeavour, and the introductions of Kevin Ellison and Paul Mullin, the Shrimps were ultimately frustrated as they enhanced their growing reputation of being League 2’s draw specialists. The closest the hosts came late on saw Amond fire over on the turn from the edge of the area before a Fleming corner was hacked away from a few yards out deep in to stoppage time. Morecambe: Arestidou, Edwards, Hughes (capt), Parrish, Beeley, Fleming, Goodall (Kenyon 72), Wilson, Devitt (Ellison 72), Redshaw (Mullin 79), Amond. Subs not used: Jones, Sampson, Williams, McGowan. AFC Wimbledon: Shea, Fuller (capt), Nightingale, Oshilaja, Kennedy, Francomb, Bulman, Reeves, Rigg (Beere 77), Akinfenwa (Azeez 81), Tanner (Connolly 66). Subs not used: McDonnell, Phillips, Harrison, Fitzpatrick.